I have continued full steam since my last post about shipping out pre-orders. I’ve hauled many boxes, labeled many packages, and spent hours on the phone with tech support when things got stuck. It has been a real learning experience doing this shipping in such huge quantities. I know there are still a small handful of you waiting on shipment notification. I apologize that it took a few days longer than anticipated. Forgive me for the delay. I assure you I’m not resting on my laurels. I’m doing my absolute honest best to get you your copies asap. Mike and Ryan were helping me today and I’ll be getting more help tomorrow. I appreciate your patience, readers! The enthusiastic feedback is very encouraging! Keep sharing it with me! The past two days will be forever blurred as one in my mind. 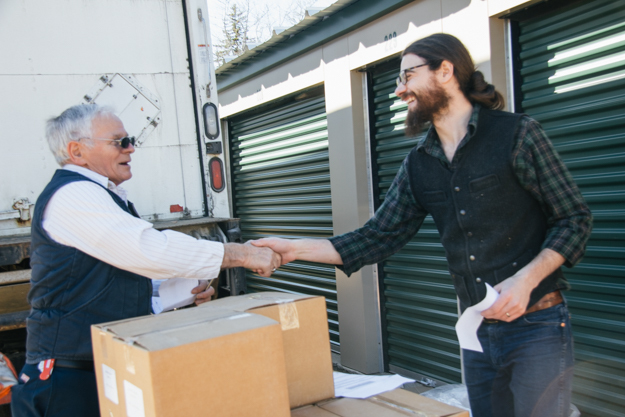 At 10:30 Monday morning, I got the long-awaited phone call from the freight driver telling me he was arriving at my storage unit with the magazines. 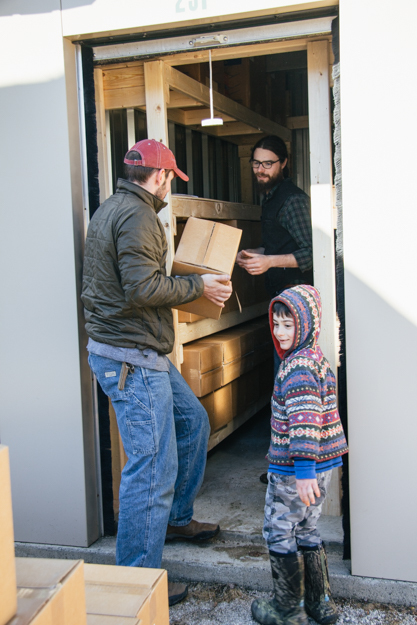 My good friend and studio assistant, Mike, and I met the driver and began unloading. Shortly thereafter, two more cars showed up: my wife Julia and my friend Ryan (you probably know him as the red-bearded Liberty Tool Company guy). 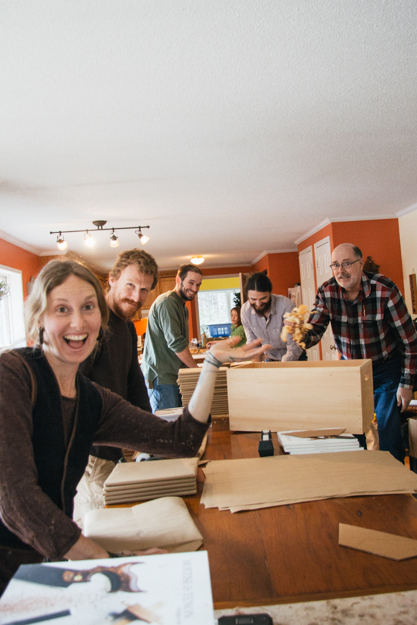 We carted the boxes of pre-ordered copies in a three-car caravan to my house/ad hoc packing facility. Then the chaos began. As we were setting up the tables and working out the workflow details, the rest of the crew arrived. There were nine of us working our tails off to get these things out asap for you readers. 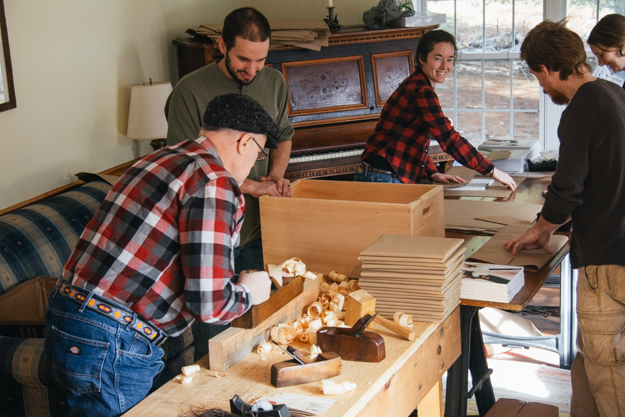 It was the perfect crew for this project: Richard (from the Living History Days event), Ryan and Tanya (from Liberty Tool), Mike (my studio assistant), my sister-in-law, my mother-in-law, our good friend Brittnay (who did the interview transcriptions), and Julia and I. We all got along so well even though not everyone had met before. The truth is most of us are drawn to this mid coast Maine area because of very similar interests. Throughout the two days I overheard conversations about hand tools, the role of traditional craft in the today’s society, local food, homeschooling, breastfeeding, spinning wool, raising farm animals, homesteading, hauling water, the role local economy plays in the development of strong community, and the evils of television. Our community here is still living out the back-to-the-land movement inspired by the Nearings in the 1950s so we were in good company. 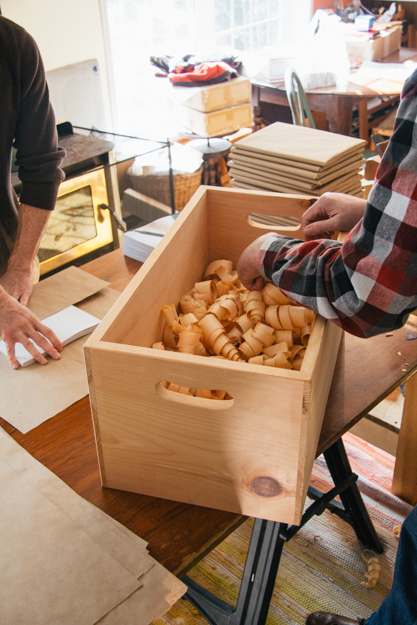 We ran out of shavings for packing halfway through so Richard began making more! The first day we were able to get just under 1/3 of them packed and dropped off at the Post Office. The second day ended up being a 14 hour day in total. 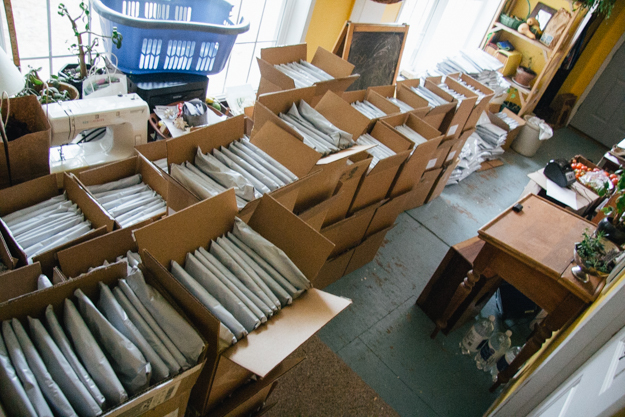 Around 8:00 pm last night, we had them all packed into the poly mailers. Today I’m attaching the shipping labels and delivering the last 2/3 of them. As you can tell from the picture below, it is still a lot of handling and hauling so I can’t guarantee they will all get out in today’s mail but I will do my best. Although totally exhausted, I am feeling very blessed to have your support, readers. Thank you so much! 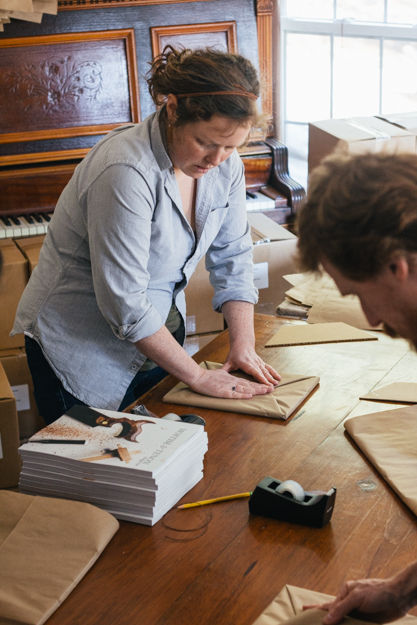 Tomorrow the freight truck with thousands of magazines arrives. I have a handful of friends lined up waiting for that truck to arrive; when it does, we will commence with the packing. I think we have enough manpower to get these things to the Post Office by Tuesday afternoon but no promises. 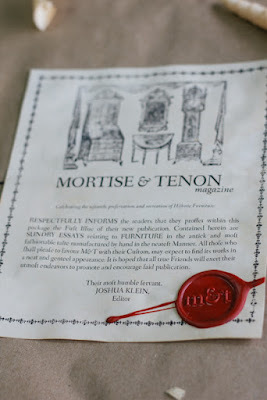 As I am about to ship Issue One out I thought it would be good to make a few comments about the connected community around M&T. One of the most powerful things about our technologically connected world is the ability to form community around very specific interests. 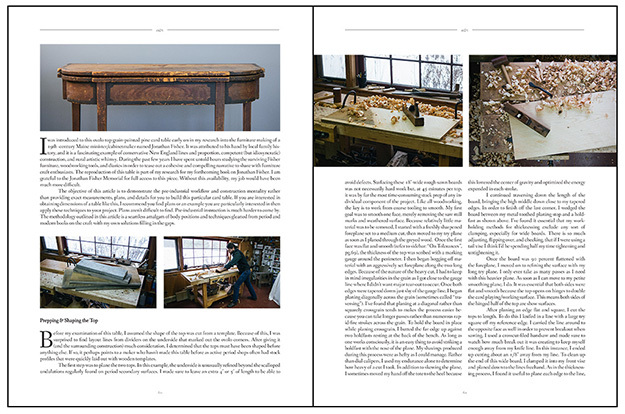 In what other time period could you have a community of 12,000 people enthusiastic about centuries-old furniture making methods? This opportunity to pool information and experience is something about the internet that I value highly. I’ve learned more from my interactions on blogs, Instagram, and Facebook than most other sources. 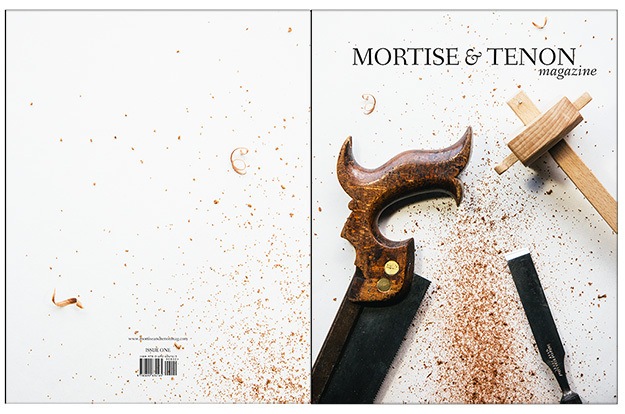 But how does the high tech ultra-connected internet “community” relate to a print magazine like Mortise & Tenon? Intimately, I hope. 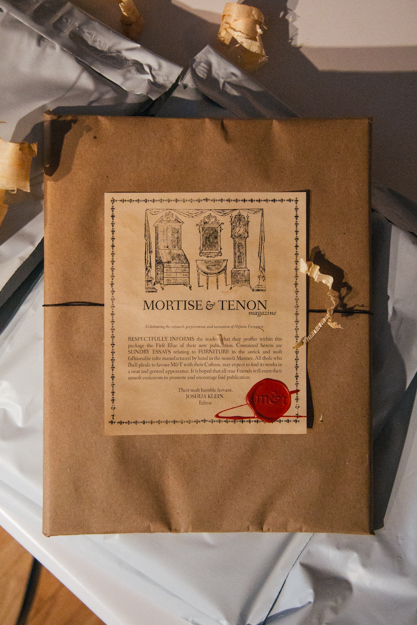 Until now, the first printing, M&T has existed only in the intangible land of ones and zeroes. There has been a lot of interaction on social media (Instagram and Facebook, especially) about the message and vision of M&T. 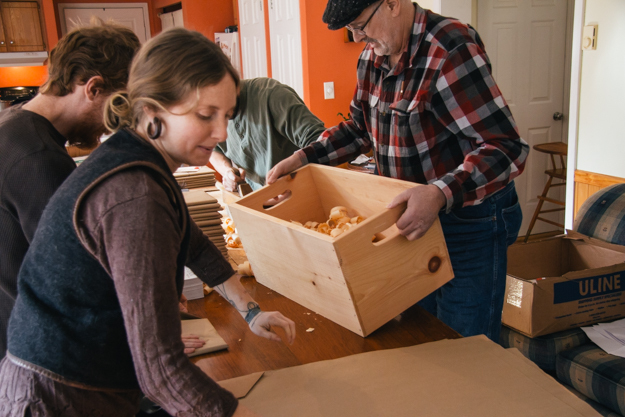 There have been folks with more experience than myself chiming in to contribute their thoughts right along with those new to the craft asking beginner questions. This is wonderful and I want it to stay this way. In both the editor’s letter and the Manifesto article of Issue One I make an invitation to readers: let’s get this conversation going. It would be a loss in my view if folks read these pages and then put it on the shelf never to engage with it. I hope M&T in print is a conversation starter rather than a final word. 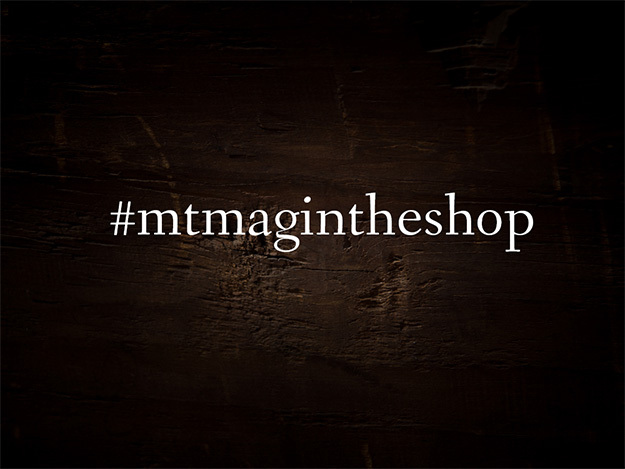 By using the hashtag #mtmagintheshop let’s get this conversation about pre-industrial furniture making underway. 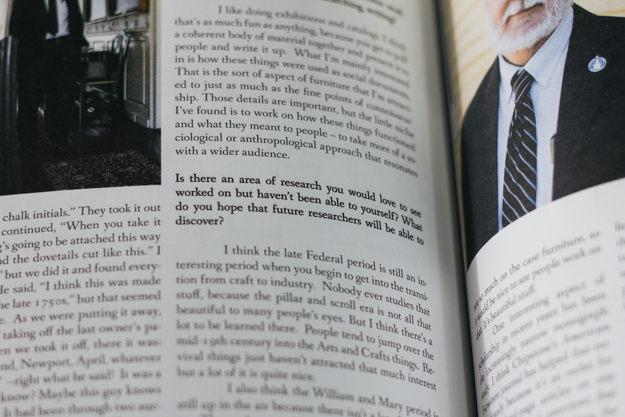 Is there something you appreciated learning in Issue One? Tell us about it. Do you have questions about something that was written in one of the articles? Ask us. Or maybe you can share a different viewpoint than the author? Show us another way. Is there a thought or quotation from an issue you’ve just got to share? By all means, share it with the world. 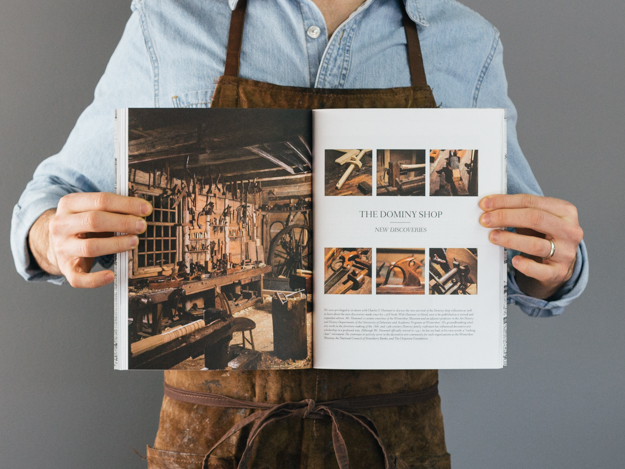 We want to see you take the pages of M&T into the shop because this magazine belongs on your bench next to a pile of shavings. So send us pictures of what M&T means to you. 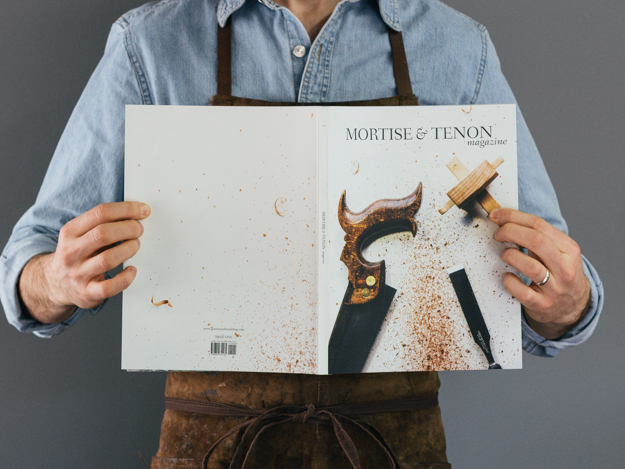 Tag us on Instagram: @mortise_and_tenon_mag and use hashtag #mtmagintheshop. We want to hear your voice in the conversation. I didn’t know exactly how to answer that because I have become so invested in this project and spent so many hours in front of my computer screen fine tuning this thing that I honestly felt a little detached from the “newness” of it all. As I pulled the first copy out and cracked open the pages, it felt surreal. Up to this point I was so acquainted with every little nuance of the design on my screen, that to view it in its final printed form was almost… foreign. To this point the world of M&T has been an intangible (and almost abstract) project. But last night was finally the real thing. The texture of the paper, the mellowness of an almost vintage print technology, and the simple heft of the publication are aspects I could only try to envision. As I am acquainting myself with this final presentation format, I can’t help but compare it to the first time I’ve met teachers whose work I followed for years before meeting them face to face. If you’ve had that experience, you know it feels surreal. You think: Is this real? Is this person I’m talking to truly the person I’ve seen in photos a thousand times? You know it is but your mind has to begin to take in all of your ideas about who this person is and accommodate them to the reality in front of you. That is the way I’ve felt since opening these pages. I’m pinching myself and only beginning to realize this morning that, yes, this is real. 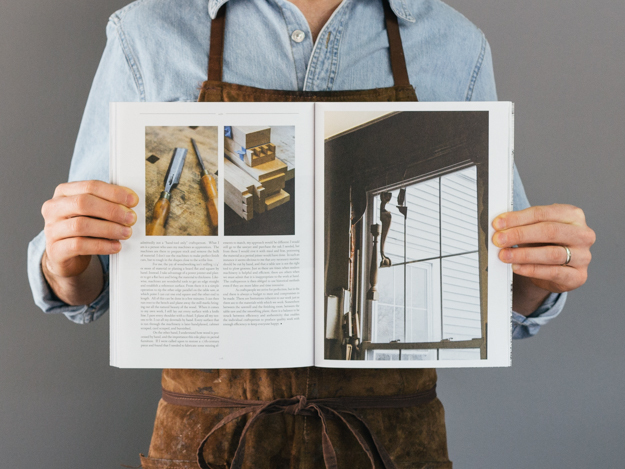 The magazine is done and it is here. I am so delighted with it and think you will be too, readers. Your copies will be arriving to my place in a few days. 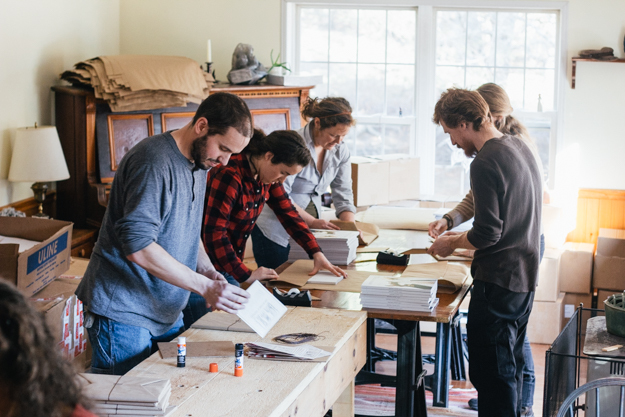 I have a crew of people lined up to help pack them and get them out the door to you as quickly as we can. It will take us a few days as we will be doing more than shoving them in a bag and slapping a label on them. 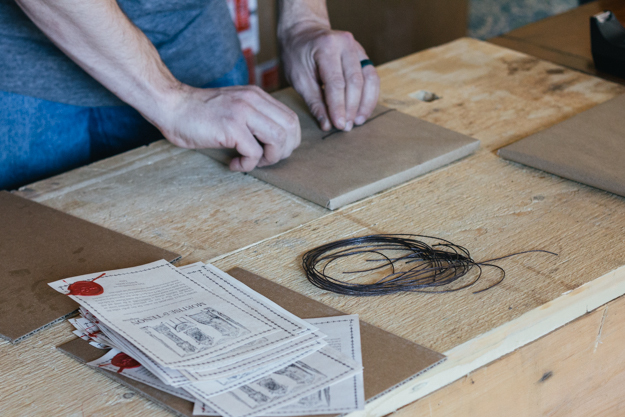 If you’ve ordered from my website, your copy will be wrapped in brown kraft paper and tied with string. Then an 18th-century style tradecard label will be adhered and will get a wax seal. I’ve been spending the past few days making and sealing the labels in preparation for packing. That isn’t Really a ‘Magazine’ Then, is it? Over the course of the past few months I’ve been fielding various questions from readers about the very-soon-to-be-released magazine. A few have asked how many issues there are in a year’s subscription. Although I’ve tried to make this clear from the beginning, I apologize if there is still confusion over this matter. This upcoming release is the inaugural issue of our annual publication. Because M&T is published only once a year, there isn't a “yearly subscription" to sign up for. We've decided that rather than ration the content out into four or six issues spread throughout the year we'd release it together as one annual volume. 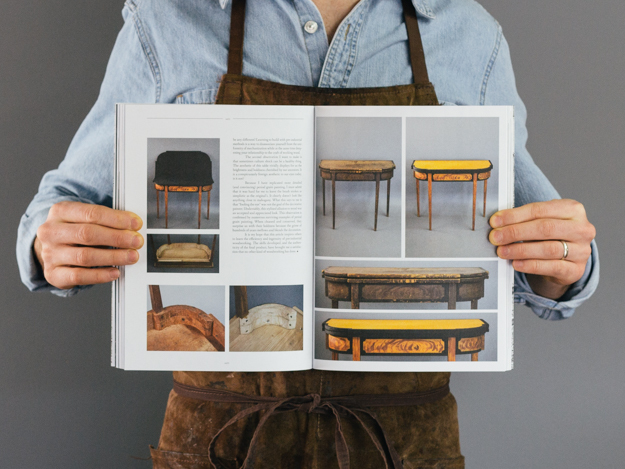 As such, each issue is offered for sale individually as it becomes available. When/if M&T increases in frequency down the road it will not be by merely cutting this content into four and then calling it a “Quarterly”. 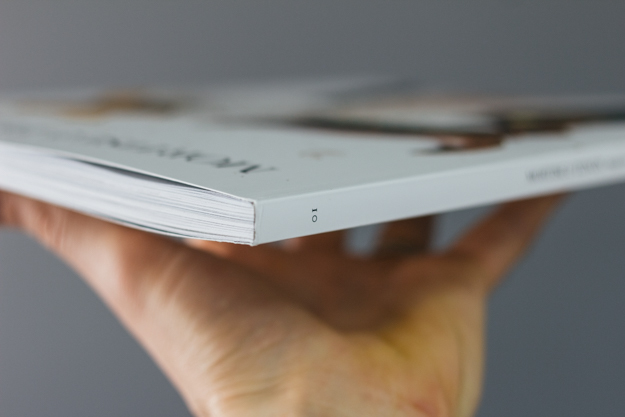 We want every issue to be substantial and book-like. 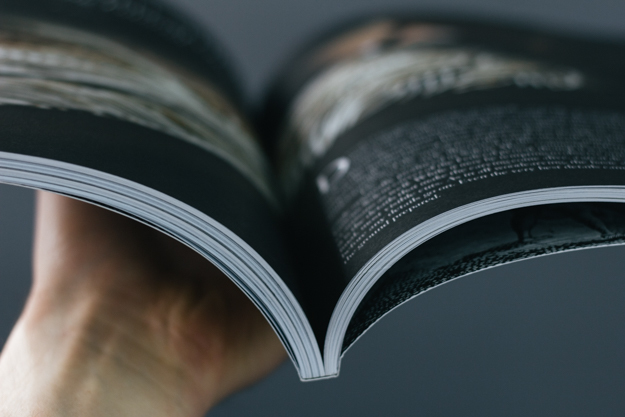 At 144 pages of ad-free body copy, I will grant that it is more like a book than a typical magazine. The cover is thick and rigid and the pages consist of perfect bound heavy uncoated paper. This massive volume weighs in at around 1 lb a piece. So there has been some confusion over the use of the word “magazine” for this publication. “Isn’t this a book and not a magazine?” Feel free to call it whatever you like but this format is not unprecedented. There are an abundance of indie magazines like this in the UK and a handful here in the US. Some of these are quarterly, some bi-annual. (e.g. 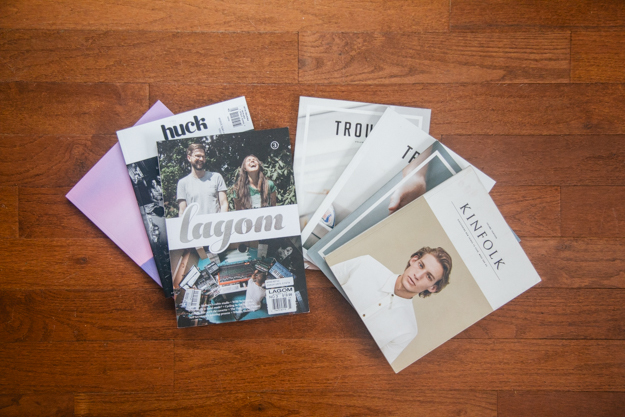 Kinfolk, Trouve, Cereal, Huck, Lagom, The Collective Quarterly) They are all on uncoated paper and have 100+ pages of virtually ad-free content. They focus primarily on lush photography with brief navel-gazing essays on “lifestyle” or “travel” themes. Although I have never been able to get myself to wade through actually reading one of those in their entirety, I do appreciate the feel and aesthetic. 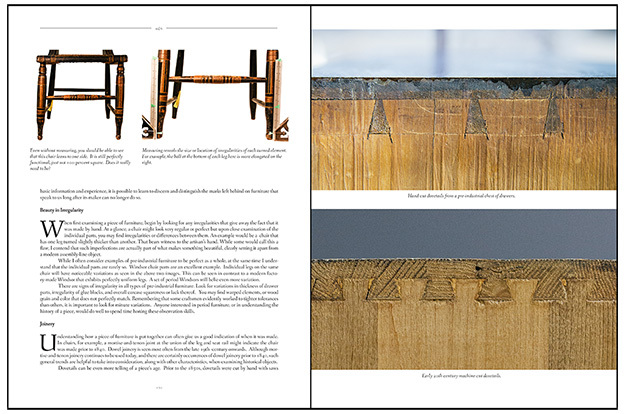 I think it is the perfect format for the unique and engaging content of Mortise & Tenon. 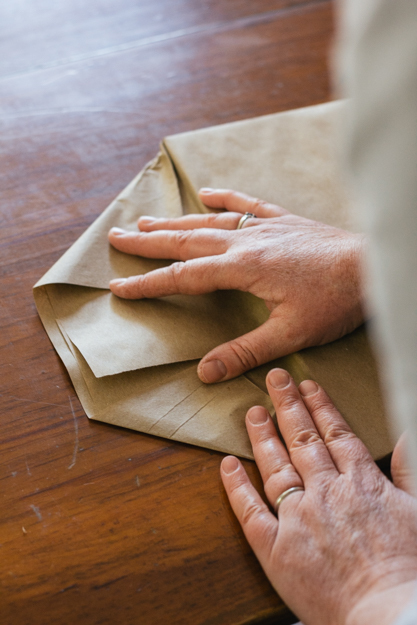 The uncoated paper gives a vintage look and tactile quality that standard coated paper just cannot achieve. My printer explained to me that the nostalgic look is a micro-bleed of the ink. Instead of the ink sitting on top of a coating, it actually sinks in to an uncoated paper causing a microscopic bleed. This is what creates that wonderful vintage look. 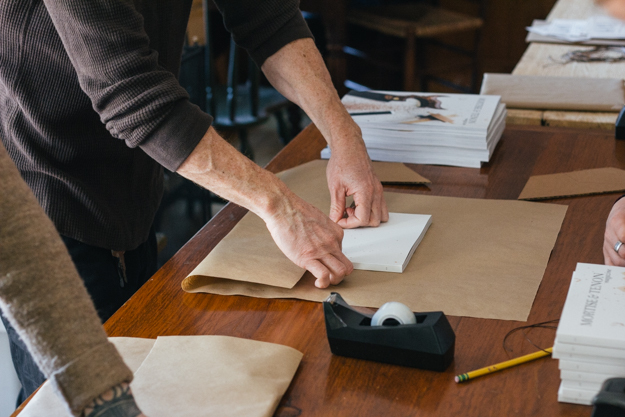 From a print techie’s perspective, the rigid and precise lines created on coated paper are more advanced technologically. 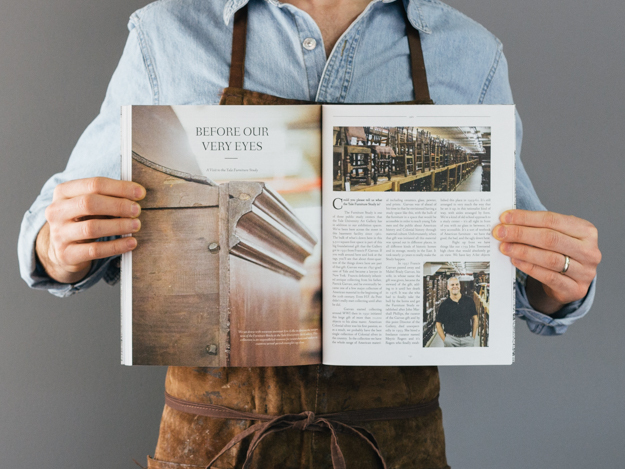 From an antiquarian’s perspective, the warmth and nostalgia of traditional uncoated stock are irreplaceable. 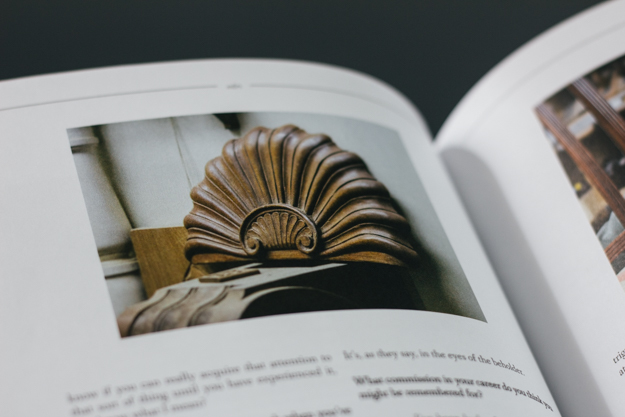 In our judgment, the coated stock is just too conventional and common place so reading a publication on uncoated paper is a special experience. But M&T is not just pretty pictures. Containing approximately 40,000 words from today's leading experts, your mind will be just as stimulated as your eyes are delighted. 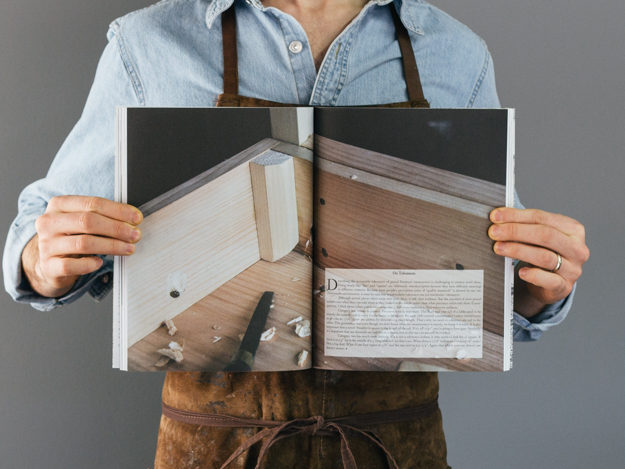 The most common complaint I’ve heard about woodworking media is that it’s skimpy on the content. I’ve taken this to heart and consequently refused to compromise word count in order to achieve a minimalist look. It’s been a challenge to make these different goals work together but I think the final result is a tasteful blend of beautiful simplicity and abundant content. I think you’ll agree. p.s. Last day for free shipping, folks. Make sure you’ve got your order in. Yesterday morning I approved the final proofs for Issue One. It is a tremendous weight off my shoulders to know it’s out of my hands now. Because my wife Julia and I can be rather persnickety when it comes to aesthetic decisions we pored over these pages time after time to tweak each image and text column just so until we were happy. 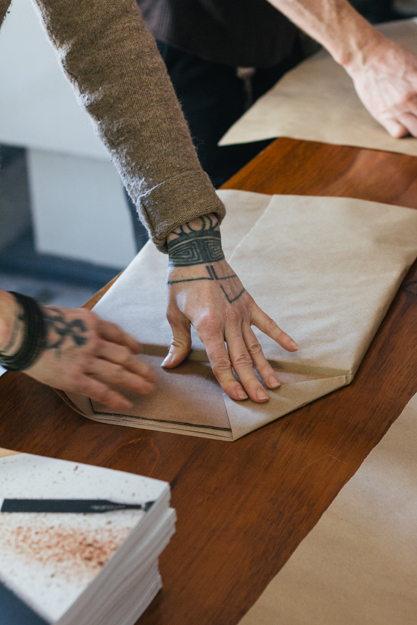 I’ve had many nights of no more than a few hours of sleep in order to refine the design to our satisfaction. 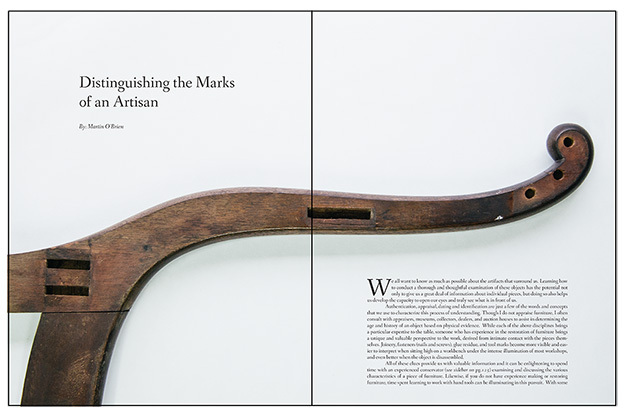 Aside from the design side of things, many hours were spent combing through the text with a fine-toothed comb. Jim McConnell, Megan Fitzpatrick, Julia, and I have been through it too many times to count. I now understand why quality publications cost what they do. So we’ve done our bit now. Issue One is designed, edited, and the proofs approved. From here on out it’s in the printer’s court. Based on recommendation, I’m using Royle Printing from Sun Prairie, WI. I’ve been very impressed with their willingness to take on a totally green start-up like myself. The account executive, Phil, has been particularly helpful in explaining technical issues and jargon in plain terms that even I can understand. He’s heard my vision for this publication and bent over backward to make sure I can deliver to you exactly what was intended. I know this thing is going to be beautiful. I’m in good hands with Royle. I also owe tremendous thanks to many people that have advised me along the way. 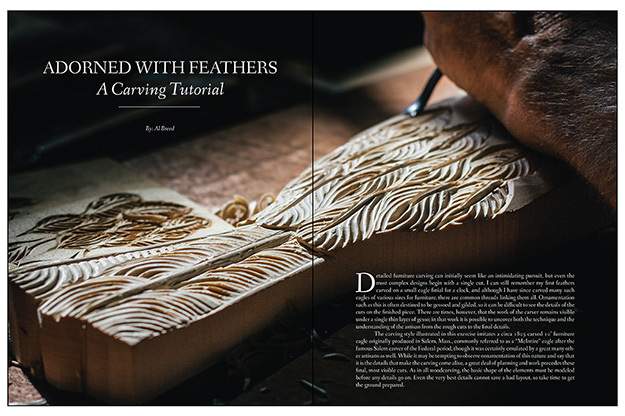 Chris Schwarz (Lost Art Press), Megan Fitzpatrick (Popular Woodworking), Amanda Marko (Trouve), and Jon Wilson (Wooden Boat Magazine) in particular have been the guiderails for me as I’ve been on this journey. 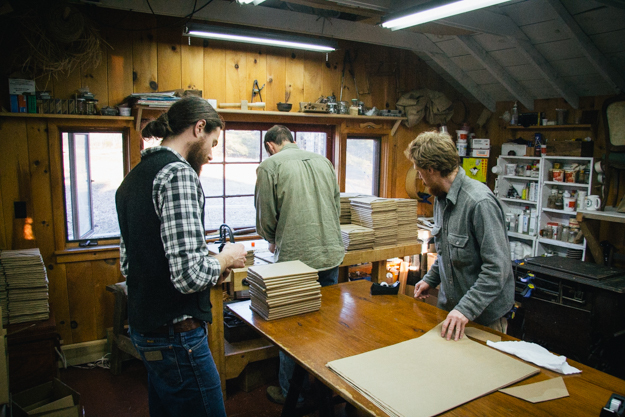 They’ve helped me to understand the business side of print in a niche market. 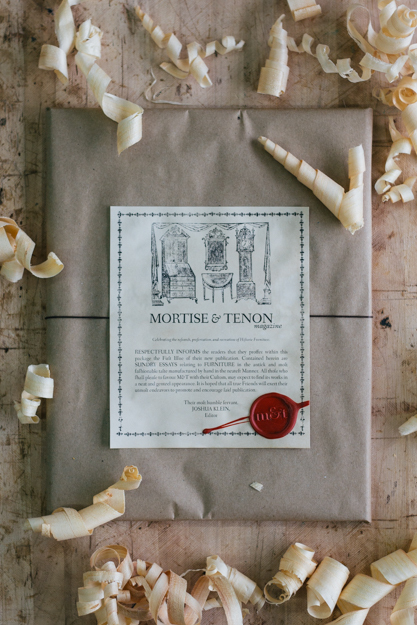 Mortise & Tenon simply wouldn’t exist if it were not for their immeasurable generosity. It’s been an indescribable experience the past nine months to watch reader enthusiasm and support surround this project. To have over 10,000 people following the progress of the magazine is humbling to say the least. I never thought M&T would grow into this so quickly. 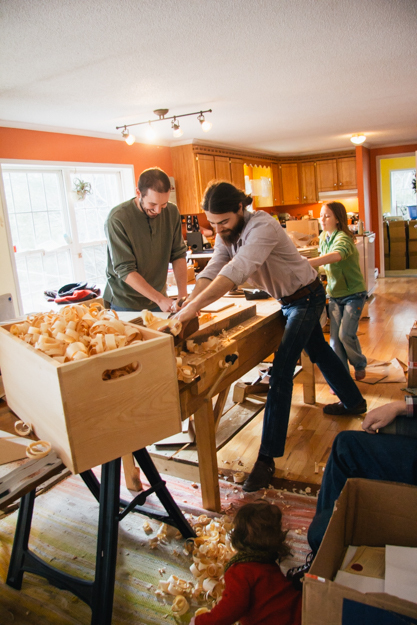 It has come clear to me that although hand tool woodworking and pre-industrial furniture is a niche topic, the interest is deep. 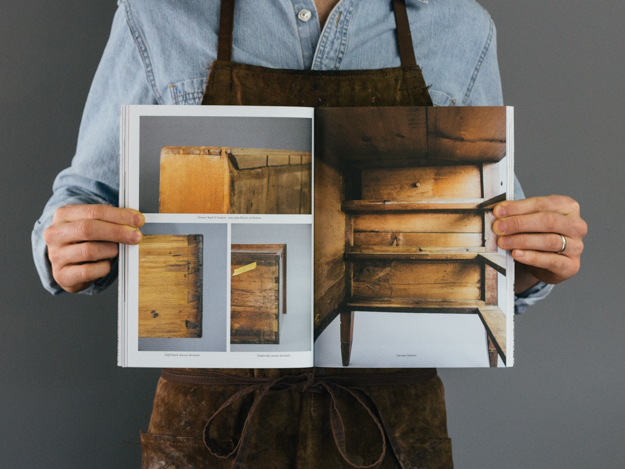 This is the magazine I always wanted to read and now, because of your support, we can. Thank you, readers. 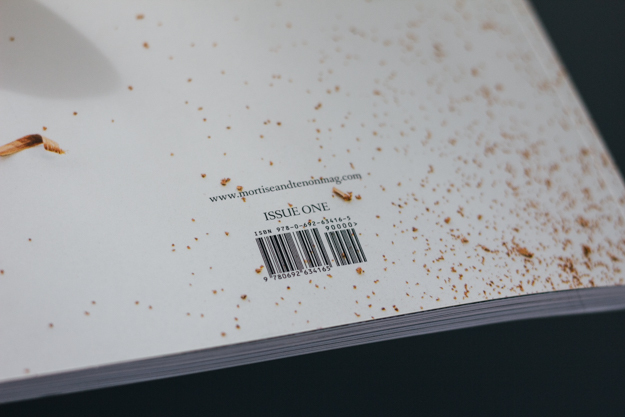 I’m looking forward to getting you your copy of Issue One. In only two weeks, when that truck shows up at my house with a mountain of magazines, this vision will come to fruition. 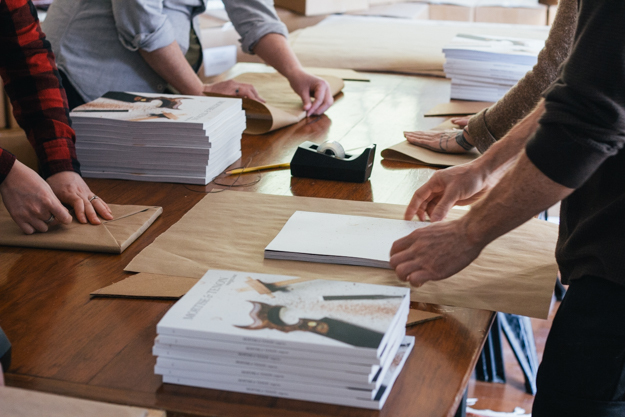 If you’re wondering how to get your hands on the inaugural issue, hop over to the website to put in your order. Please note that free shipping on pre-orders ends on the 10th (only one week away).